Program Evaluation and Performance Measurement 2 Edition Program Evaluation and Performance Measurement: An Introduction to Practice, Second Edition offers an accessible, practical introduction to program evaluation and performance measurement for public and non-profit organizations, and has been extensively updated since the first edition. Using examples, it covers topics in a detailed fashion, making it a useful guide for students as well as practitioners who are participating in program evaluations or constructing and implementing performance measurement systems. 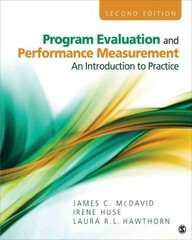 Authors James C. McDavid, Irene Huse, and Laura R. L. Hawthorn guide readers through conducting quantitative and qualitative program evaluations, needs assessments, cost-benefit and cost-effectiveness analyses, as well as constructing, implementing and using performance measurement systems. The importance of professional judgment is highlighted throughout the book as an intrinsic feature of evaluation practice.